What Are “Micro-Moments” and How Do They Impact Your Business? Want more from businesses online. Want it available on any device they choose to use. Want it wherever they happen to be when the thought occurs. It’s time for businesses to adapt to the new ways their potential customers and clients are using online search to connect. As mobile searches take a bigger piece of the pie, Google recommends that businesses be aware of their target audience’s behavior in online “micro-moments,” and aim to be there when and where their customers need them. The old model of user behavior was an orderly journey from question to search to website results. 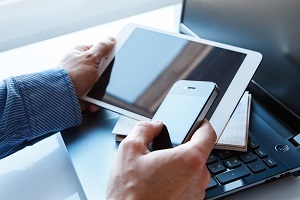 While plenty of users still search this way, it is now a multi-device world, and people are connecting with businesses in brand new ways. They may initially sit down at their desktop computers to research a question, but they are also picking up their phones to look for answers or reaching for their tablets to continue the research they started earlier. This means that, instead of an orderly search journey, people are popping into and out of online search—especially on mobile devices—all the time, at every stage of mulling over a problem or looking for the best solution. I-want-to-know moments. Before people make buying decisions, they’re getting informed online. They may need a quick answer to a question, or they may spend a little more time researching a product or service. They may even just be curious about something they’ve just seen or heard, like a television commercial. In those moments, they’re turning to their phones and tablets to get the initial information they need, and sometimes using multiple devices to later pick up where they left off. I-want-to-go moments. How many times have you picked up your phone on the way out the door and searched for “restaurants near me,” or started your search for a doctor by looking for “family physicians near me.” Google reports that “near me” searches have doubled over the last year, so it’s important for businesses to be there, front and center, when potential clients are already in action and looking at their local options. I-want-to-do moments. People look online when they want to know how to do something, and they’ll search from their devices as soon as they think of it. This is an important moment for businesses, who could be right there with answers about how to take action. Don’t forget about video searches in these moments! Google reports that “how to” searches on YouTube are growing by 70 percent year-over-year. I-want-to-buy moments. Businesses have always vied to be in front of their customers when they’re ready to buy, but mobile search has changed the ways people make their buying decisions. People are far more likely to use their smartphones to make decisions, sometimes while they’re standing in a store or waiting in an office. Even when they’ve already walked through your door, your mobile presence—and your understanding of their needs and expectations—matters. Ultimately, the whole idea of micro-moment marketing is to be there in those little moments when your potential clients are looking for you, and to have something brief and useful to offer to them. Users may only have a moment to spend looking for an answer, but it’s important to be there at every stage of the process. Otherwise, you look like the stranger that shows up only at the last minute, when they’re already ready to make a buying decision, claiming that you’re the right fit for their needs. It’s just not enough. In some ways, taking advantage of micro-moments takes a huge shift in your online marketing perspective. In other ways, though, it boils down to something we’ve been telling our clients for years: you need to pay attention to the user experience you offer on mobile. Why Do Micro-Moments Matter for Medical Practices and Law Firms? Google identified the “mobile moment” all the way back in 2014, so this user behavior is really nothing new. It’s now 2017, and those “mobile moments” have continued to grow and become a routine part of the way people choose businesses online. Currently, most doctors and lawyers offer a better online experience for their desktop users, and their mobile presence is weak. The new push toward “micro-moments” means that they may need to make up for years of lost time and mobile optimization. The truth is that the shift to micro-moments matters because it has already happened, and many service-based businesses are still not paying attention. The one thing that all the micro- or mobile-moment searches have in common is that they are largely performed on mobile devices. Google is currently penalizing companies, even on desktop, if they don’t have a mobile-friendly site. If you ignore this shift in behavior, or if your mobile website is lacking, you’re missing out on traffic that even Google is urging businesses to pay attention to. Does your website have the power and mobile functionality to attract the clients you want when they need you? Are you there when your potential patients and clients are looking for you? If not, you’re already losing the “micro-moment” game. Get up to speed by scheduling a website design consultation and mobile analysis with our talented team of marketing experts, or give us a call to discuss what “micro-moments” might mean for you.